According to the survey by Social Media Examiner, 97 percentage of marketers are now utilizing social media marketing as an essential part of their digital marketing strategy, while 80 percent of marketers indicated that their social media efforts improved traffic. Likewise, the benefits of social media marketing can be described in different ways. This proves a huge potential for social media marketing to boost sales. Still, If you are thinking a little hesitant about whether social media marketing is worth or not, we have listed the top 10 benefits of using social media to grow your business. Let’s delve into the benefits of social media marketing. Increasing brand awareness is one of the most prominent benefits of social media marketing. It will make it comfortable to spread the word about your products and mission. Having a social media presence is one of the natural ways to improve the visibility of your product or brand over the world. With the infinite social media platforms such as Instagram, Twitter, YouTube, LinkedIn, and Facebook, you will be ready to reach networks that may have before appeared impossible to connect with. With social media, your consumers effectively do the work for you. Executing a target-oriented social media strategy will greatly enhance your brand recognition, as this will assist you to be engaged with a large audience of potential customers. If a business can convert customers through social media, those customers will surely become more loyal fans. Social media provides businesses with insights about their target customers. Although, knowing your customers can help your business find inventive ways of reaching them via advertising and content. Besides, targeting to the particular needs of your customer can result in improved conversion rates and will increase your entire sales. Social media plays a great role in increasing the search ranking of your website as it makes traffic from social media page to your business site. It is one of the biggest benefits of social media marketing. It helps marketers be ready to rank in the top positions for their keywords that transform traffic and continue to produce positive results for their online business. By building a small ad budget to promote this content on a social media platform, you can reach new buyers interested in your brand. According to the survey, social media drives 31 percent of website traffic. By implementing social media to your marketing plan, you are adding exceeding paths leading users back to your website. Although, creating high-quality content for your social media profiles will assist you to have the best chance of ranking better in SERP. Therefore, the more quality content you share on your social media, the more traffic you will generate while generating conversion opportunities. By acknowledging your consumers, and enabling them to get personalized messages whenever they get a comment on your social media pages, you can assure better customer experiences that eventually translates into customer satisfaction. All customer interaction you have on social media is a chance to publicly show your customer service level and enhance your relationship with your consumers. Moreover, customer interactions on social media pages are possibilities to highlight your compassion for your customers that improve customer satisfaction. Also Read: Top 15 Social Media Marketing Skills You Should Have. Social media is not only great for engaging with potential customers. Besides, you will get the benefit of associating with influencers and people that can possibly link to your website. Nowadays, people utilize social media to connect with people, be entertained, and discover information. This interaction allows you to stay relevant between your peers, and thought leaders. Therefore, you should first look to connect with your consumers on a personal level and look to sell lasts. Social media is acknowledged as the best medium to generate conversation, improve customer engagement, and positive interactions. As per the report, brands who engage on social media channels enjoy higher loyalty from their consumers. Brands that engage with their consumers on social media can anticipate enjoying significantly better brand loyalty than those who don’t. Moreover, social media marketing allows you to build ongoing relationships with your fans and followers every time you post, share videos, or a status update. Each blog post, comment, status update, the comment you share on your social media page found a chance for someone to react that eventually grows your site visits. Social media marketing enables brands to be more humanized by interacting with customers via social media channels, which influence prospects convert and be loyal consumers. It is a great place where brands can act as people do. Therefore, a presence on social media greatly improves opportunities for consumers to convert to your brand. According to the survey, social media has a 100 percent higher lead-to-close rate than outbound marketing. Social media platforms like Facebook and Instagram have even started implementing purchase buttons right onto the social media posts. As such, simply creating your audience in social media can increase conversion rates on your current traffic. Nowadays, social media helps businesses to keep an eye on their rivals. It allows you to keep tabs on your major and minor competitors. Besides, you are capable of understanding how your competitors are interacting with their customers, the frequency of their posts, the type of content they post, etc. Hence, it is a great way of scoping out your industry and discovering ways in which you can stand out from the competitors. Social media is one of the most cost-effective elements of any marketing strategy. It is one of the most important benefits of Social media marketing. By investing in social media marketing, organizations can drastically reduce their entire marketing costs. Facebook, Pinterest, Twitter, and LinkedIn enables you to promote and share content without any cost and time spent. Besides, these platforms offer advanced and affordable advertising platforms that you can utilize to target your customers with keywords, demographic, and interest-based campaigns. With the right social media strategies, you will be capable to advertising your business and still develop your business without spending more money. Social media always helps you to establish your brand as an authority in your industry. Posting original and powerful content about your products and services on social media can make you a master in your domain. Moreover, you can be a social influencer that will assist your company to have a strong fan base, enhanced authority, and elevated thought leadership. Therefore, the more you utilize social media to post relevant content, the more search engines will accumulate on your authority. Moreover, social media lets businesses interact directly and instantly with clients, improving customer satisfaction. Besides, the more valuable information you put out there, the more readers want to get back and share your content. This will lead the followers to look up to you that build a relationship with your clients that they appreciate and accept you as an influencer in your industry. 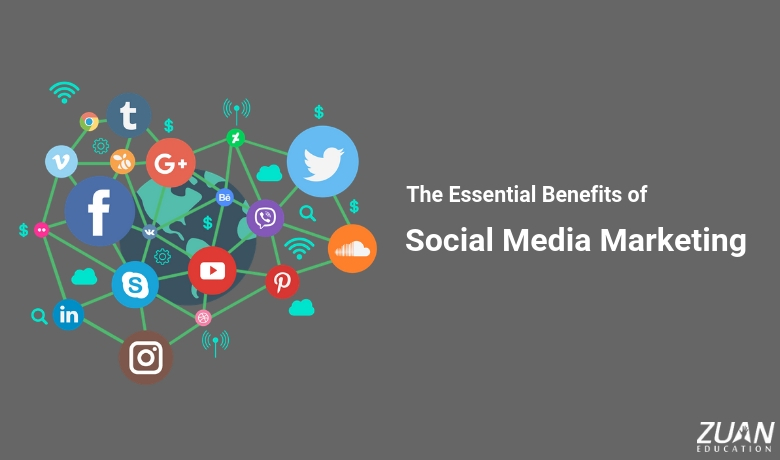 Hence, these are the essential benefits that businesses stand to gain from social media. Each and every benefit are all different factors that play a role in your campaign results. Understanding the benefits of social media will not be enough. By using social media strategy allows you to prepare for your business victory. Therefore, you can implement the right strategies for your business to obtain the results you want. If you are interested in getting started to learn social media marketing, visit Zuan Education or call 9025500600 to get the details about the course. Remarkable article. Social media is the best way to reach customers. You have targeted game-changing points which can enhance the value of the website image. As you said in the 5th point, it helps in engaging the customers by using correct measures to make then to comment or share the post. It helps in grabbing the targeted audience in an efficient way. Thanks for sharing the wonderful article with us and make us aware of the opportunities available in social media. Your Blog is awesome, SMM article is great. On the internet essential in order to are sure what content you are putting up for customers. Remember that are optimizing individual pages to rank well, Social media helps to promote the website.